The Mercedes-Benz A-Class hatchback range in Europe has been expanded by the addition of two new diesel engines. These variants are termed the A 200d and A 220d. Both cars are equipped with Mercedes' newest generation 2.0-litre diesel motor, which does duty in cars like the C-Class here. In the A 200d, this motor puts out 150PS and 320Nm while in the A 220d this goes up to 190PS and 400 Nm. The A 200d gets from 0 to 100 kmph in 8.1s, this drops to 7.0s in the A 220d. The base diesel A Class is the 1.5-litre diesel in the A 180d. The A Class is based on the new MFA II platform which will underpin a host of other small cars from the brand. 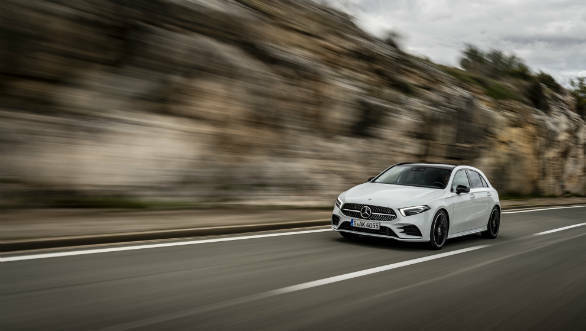 The interiors of the new A-Class is dominated by the MBUX AI-based infotainment screen and features the traditional Mercedes attributes of plush materials and high quality. There isn't news as to when the new A-Class will come to India. These engines could come in as higher-spec versions later on when the car is launched. We expect the hatchback to come to India by the middle of next year.